... my criteria ... [was] doing what I had not seen in the current dance work out there. That was my mission. Q: Let me begin by directing some questions towards Sally. I'd like to know, Sally, about the origins of your thinking about movement. What were your early artistic influences in dance? SS: I danced growing up -- you know, the little girl stuff -- ballet, tap, very small-town stuff. And I didn't think of it as anything else except something fun to do. Then I went to Antioch College, where I got my B.A. Cecil Taylor, the jazz pianist, was an artist in residence there. He brought a choreographer with him from Milwaukee, an African American man, his friend. His work influenced me. And I had also taken dance at Antioch. One dance teacher, who came from Bennington College, had a sort of eclectic style incorporating work like Merce Cunningham. But I didn't really know much about modern dance. At that point, I had been to the ballet, but I hadn't seen a modern dance. So I started working with Ken Miller, the choreographer. He was very serious. He was an artist and not a teacher. There was something different about the way I began to think about dance, working with him. I hadn't really thought of dance as an art form I would be interested in until that point. I got involved in this project with him — he was there at Antioch for about a year and a half — and I was performing on stage. I was one of the few people who stuck with him for the whole period of time — he was difficult, demanding, even confrontational, I would say. But I stayed with it because I was bitten by the performance bug. It turned out that I was good on stage, that people were drawn to my performance. And I got a little attention. I have some kind of performance ability — I don't know where that came from. I'm not conscious of turning it on and off, but there's this kind of aliveness that happens to me when I'm in public. Then, I came to New York. I was conflicted about that decision to move to the city — I almost took a job working for a coal-miner paper! But, at the last minute, I decided to come here. At the time, I still didn't know much about postmodern dance. I had seen Twyla Tharp and Wendy Perron. The latter had came to Antioch and danced in sneakers. That made a big impression on me. 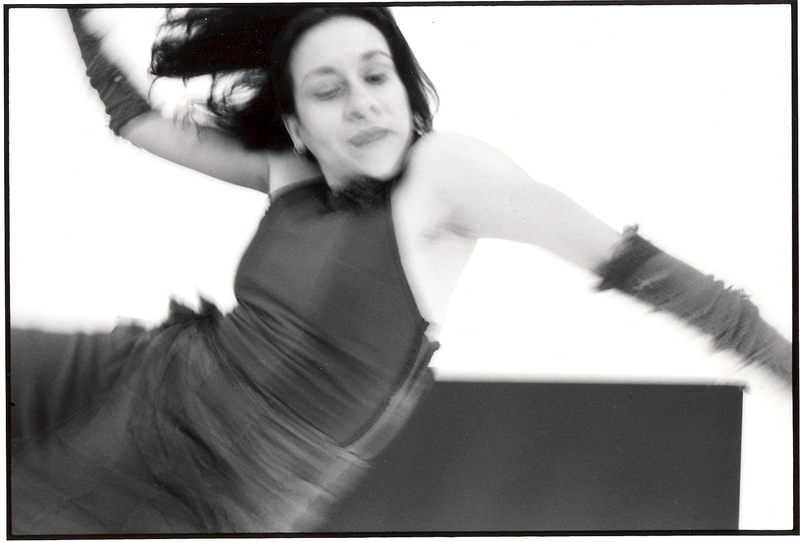 But I soon made some discoveries, like the work of Trisha Brown, David Gordon, Sally Gross — many people who had roots coming from the Judson Dance Theater tradition, which had been starting over with what dance can be. Yvonne Rainer — I ended up later dancing with Yvonne — was one of the founders of the collective that formed around Judson in the early '60s. I changed tact. I started taking class from these people who had been associated with Judson. Still, I wasn't winning auditions. I'm a slow learner; I'm not one of those people who can learn movement easily. It's a gift that dancers have; and if you do it more, you do get better at it. But you'll never be as good as those for whom this comes easily. Those dancers have a special eye, a brain-body connection — and that's a gift. SS: ... yes, but I feel I'm not gifted at that particular thing. Which may be OK, since I became a choreographer. I wasn't a choreographer when I started out dancing. I was a dancer, for sure. A lot of things came together to make that transition happen. One was that I met Bruce. I had gone out with poets before, but no one with his approach to poetry, and no one with the influences he had in his poetry, including improvised music and film — as well as work from other experimental writers. Q: So that was about 1978...? SS: ...and going to auditions... and working a day job. I worked for an organization that supported prisoners' rights, still combining my politics with the dance work. Q: I read about your father — he was mentioned in an article on you, Sally, in the New York Times, when your recent collaboration and concert, Yessified!, was staged. Wasn't your father a defense attorney who worked for Civil Rights and left-leaning causes? How did he influence you? SS: Yes, my father was a lawyer in a small Appalachian town, and he had very liberal ideas in a place where almost everybody was still small-minded. He took a position that was influential on all his children, as well as friends and acquaintances. Q: He influenced you when you were very young? SS: Politically, yes — and as my father. He came from a coal-mining background. His attitudes were very different than those of the parents of my friends. But I was also rebellious. I became more radical than he was — so maybe that was the rebellion. Q: You took it the next step? SS: Yes. I wasn't going to stay the nice little liberal. It was the heat of the '60s. I went to Antioch, after all, the hot-bed of radicalism. When I met Bruce, he turned me on to more artistic experimentation as well as sharing these politics. Things that were related to the way Bruce wrote. I was already interested in experimental film. And I was already discovering experimental dance. But I didn't know about this thing called experimental music. Q: I'm just curious: How did you two meet. Was it an artistic event? BA: Yes, we met at a book party on the Upper West Side. SS: I had gone with a friend from college... and Bruce was there, with a novelist. I hadn't tied my dance work yet to other experimental art forms. Even though I had seen experimental dance, I think I was still stuck on this traditional training that I had been raised on and groomed on. I somehow hadn't understood how experimentalism could happen in dance. BA: And you have to remember that, by the late 1970's, the Judson movement school from the '60's had nearly disappeared — really, by 1975. So those drastic influences had gotten watered down. People like Yvonne Rainer had stopped making dances — she became, of course, a major filmmaker for 15-20 years. Other work in dance became a little more tame. Q: What about Movement Research. Didn't that come out of Judson? BA: Oh, yes, that would be one of the places where some of the work from Judson went on. And there are still places now where the legacy goes up and down. SS: In fact, they're having a whole Judson platform right now, through November. So if you want to catch any of the greats, they're coming back. Yvonne Rainer is doing a performance. It's the 50th year anniversary of Judson Dance Theater. But in the late 1970's in New York, people got interested in different things. Q: What was the "split off" — what you have described here — between the tradition of dance you were coming out of, and what Judson and those post-modern movements were doing? SS: The experimental movement here in dance was investigating what it was possible to do, what could possibly be called "movement." These people broke the mold on technique — [in modern dance] you had to go through a particular study that was a technique in order to become a dancer. There were the great ones, the founders of modern dance, and that was what was being taught in academia. No one was doing postmodern dance at the time. And so the Judson people broke the mold on dance vocabulary, they did movement that was more pedestrian, they did collage, they worked with people who weren't dancers. Q: By "pedestrian," you mean every-day movement? SS: ... yes, walk, or crawl, or run, or skip, anything that a child, for example, would do —. BA: — and not to be clever or coy, but to open up the arena of what movement can be. To investigate how this would look, and how that would work, and ask: can we do this upside down, can we do this hanging from a wall, can we do this with sound? There was a lot of multi-media stuff going on, Happenings, Fluxus, lots of performative work. There was an elaborate cross-genre thing going on. So when we got to town, and wanted to be involved in radical dance, people said, "Gee, you should have been here 20 years ago." Q: But don't they always say that? And isn't there always something "happening"? BA: Well, as it turned out, it was easier for Sally to be inspired by what was happening in other disciplines. Because what was going on in dance was much more tame by that period of time. SS: Yes, there was a new lyricism coming back into movement in the late '70s and early '80's. SS: ... yes, the Reagan Era started. And there was more autobiographical work coming on stage for dance. Q: Some of that might have happened, too, a bit later, in literary studies, people doing less theory work and beginning to do more biographical / autobiographical work by the late '80s at least, into the early '90's. SS: And the world of finance of the '80's also was part of that trend — Bruce sent me this article recently, in which the author argues that this is when money became the product, and the casino of Wall Street was made, and not manufacturing. The divide started right about then. SS: ... and people who had been involved in the '60s felt up against a wall. And political work was now becoming work in which you discussed your identity politics — and all the things that were wrong in America. There was less interest in vocabulary and movement and form. Like: what forms were possible in dance. So if you tried to do anything that had relation to the earlier Judson school and those experiments with form, there wasn't much place for this any longer. SS: So I was looking for some kind of community in dance at that period in the late '70's and into the '80's, for which Judson was the model. There was at that time a community in dance. It just wasn't going in the direction that interested me. Q: But when you're truly an innovator — and you were mixing new things — community can be disappointing. SS: Well, people came along later. And there were interesting pieces being done, as well. But I wanted to emphasize the vocabularies that could be available to dance and that still were not. My first 10 years I think I spent battering with vocabulary, not thinking about themes. I was basically recording myself in the studio, performing movement that I hadn't seen in other people's work. That was my criteria ... doing what I had not seen in the current dance work out there. That was my mission. BA: — and she (Sally) used her own poetry text in that performance. Q: Yes, it was a stunning, powerful piece. The text was amazing as well as your staged movement. And let me ask a bit more about your own poetry writing — for I read somewhere that you have long been a poet, too. SS: Well, I have written a little bit, but I started really, I would say, after meeting Bruce. I didn't start writing until I learned about other ways to write, which he introduced to me. My early image of poetry was the same as my early image of dance — I hadn't been radicalized yet on that front. Just understanding what Bruce's process was helped me to make the change. I also took a workshop from Charles Bernstein at the Poetry Project — this was sometime around 1979 — and that influenced me. At that point, I started doing writing, finding my own method. And sometimes I would read this work before I would perform on stage. PART 2, "WHEN BRUCE MET SALLY -- SALLY SILVERS AND BRUCE ANDREWS IN INTERVIEW"
WEDNESDAY, NOV. 28, 2012 at 8 p.m.
Sally Silvers, "Bonobo Milkshake," An Ensemble of 7 dancers. Original soundscape & text by Bruce Andrews, paired with experimental composer Michael Schumacher.